We came out into the bright sun outside the airport terminal. 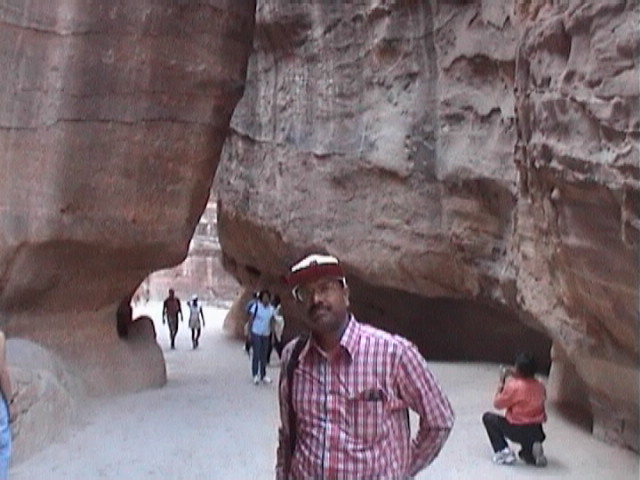 And, Ahmed, our guide-to-be, welcomed us with a white cap, trendy sunglasses, a wide grin, and an indian namaste. 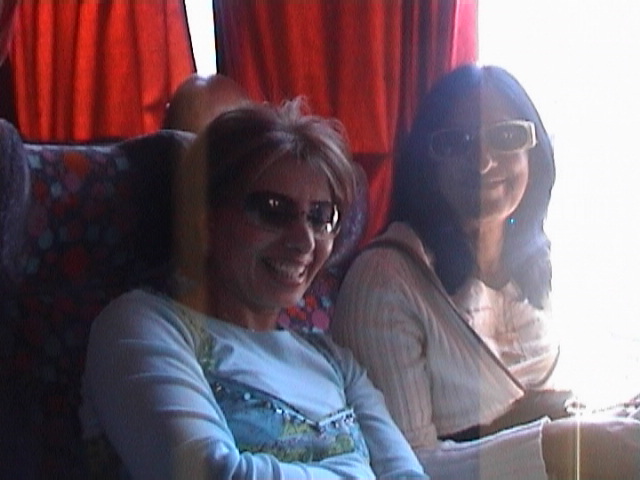 "Welcome to the Hashemite Kingdom of Jordan", he cheerfully said, after 25 of us boarded the minibus. He was holding the bus microphone, that was soon to hear a number of historical facts, figures, stories, and jokes, songs and strange names. Soon, our journey started towards Petra. about 200 Km south of Amman. Ahmed' s enthusiastic descriptions and details were periodically interrupted by a busload of laughs, giggles, wise cracks and repartees. But he kept going undeterred and undaunted by the mob that was unruly at times. "Jordan was called different names at different times. 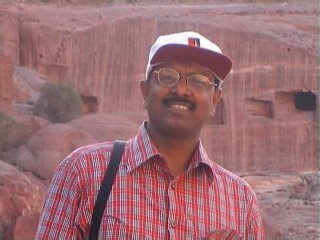 It was called Rabath Ammon, then as Philadelphia, then as Transjordan and and now as the Hashmetite Kingdom of Jordan", said Ahmed. 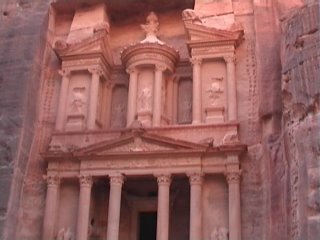 After a long journey of four-five hours, we reached Petra, an amazing ancient town-city carved and cut in stone. It was called Nabataean Kingdom in 1st Century AD. After being lost to the western world for nearly 300 years from the early 16th century, this city was discovered in 1812 by a Swiss Traveller Johann Ludwig Burckhardt. Threading our way between the cliff walls that soar upto 80 meters, we passed inscriptions in ancient languages, rock-cut chambers into whorls of sandstone. There is even a 3000-seat theatre built in Roman Style. But Egyptian architectural influence is evident in the rest. Treasury, the main monument of Petra was used in the film, Indiana Jones and the Last Crusade. (By the Way, we had to unfortunately miss going to a place far from here called Wadi Rum...which the Jordanians say is Jordan's answer to the Grand Canyon. Same coloured sandy desert...which apparently was used to depict a different planet in the film - Star Wars Prequel Attack of the Clones). In the old testament or biblical times, this entire area was called Edom, (Edom means 'Red' and also the other name of Esau - twin brother of Jacob - who came out first from his mother, Rebecca's womb, but with Jacob, holding his heel) Genesis 25:30. Much later, after a few generations, when the Israelites returned free from Egypt to Canaan (which is present day Israel) they pass through Edom. But as the King of Edom does not allow them, and they go on what was called the King's Highway [Numbers 20: 17]. The name's still 'Kings Highway' and can be seen written on road signboards as our bus passed through. Soon after they pass along Edom, Moses' brother, Aaron dies [Numbers 20 :23-29]. And hands over charge to his son Eleazer. It is here, in Edom ( or Petra) that we saw Aaron's tomb, from afar. A white domed structure is built on a mountain believed to be the burial place. Except for taking photographs, we were however unable to go up the mountain. After a warm shower, in our hotel, and after a delicious way-side dinner in a mild breezy weather, as a group, we trekked back to the lovely Hotel, where it was sleep as soon as I hit the bed! After the long walks - along the winding rock corriders of rock-cut Petra and along the short hilly tracks - the feet and body were just yearning for a well-deserved rest. And rest they did.